I'm leaving (the US) for the Dominican Republic tomorrow and I only just discovered that credit cards charge a 3% fee on every transaction. I haven't been out of the country lately, but this isn't how I remember traveling in the past, when I was told to use credit cards everywhere, because you get a decent exchange rate and no fees. Still that seems to be how it is. ATM withdrawals seem every worse, paying the fee plus a withdrawal fee. So now I've got a big problem. I don't want to pay that fee everywhere I go, but I also don't want to walk around with a lot of cash. Firstly, not all cards have foreign transaction fees. Most cards nowadays that are fancy enough to have annual fees wouldn't have foreign transaction fees. Also check your debit card. Otherwise, your best bet is to withdraw money from an ATM in the DR. Out-of-network ATM fees are typically flat, so if you withdraw all the cash you need at once, it'll only cost you a few dollars. Of course, if you have any leftover cash, you can't really turn it into something usable in you home country without exorbitant fees. I usually end up withdrawing money every few days, but it's still cheap since it's a flat amount regardless of how much you withdraw. At this point, you have no realistic options other than not using the credit cards you have. Then, only take out as much cash as you feel comfortable carrying. Sorry. Note however, many travelers still recommend using ATMs because the fees are still usually lower and the transaction fee is really no different that using an out-of-network ATM in your home country. In the future, you can get a credit card with no foreign transaction fees. 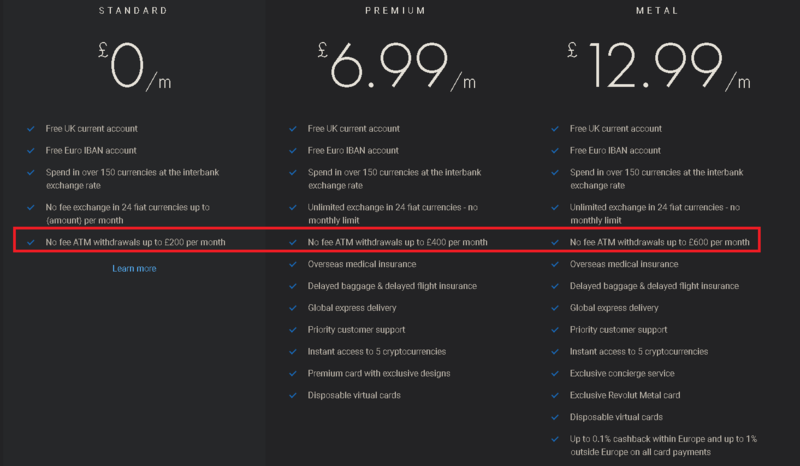 Any 'premium' travel card has this feature though they may carry an annual fee. Right now, you might explore whether you can find a pre-paid Visa or Mastercard with a better surcharge than your credit card, and then load that up. I have to frame-challenge your belief that 3% is "gouging". First, you have to consider your alternatives. Changing money isn't free. International banking networks are not free. Really. You don't get to armwave it as "free", the businesses you are trading with have overhead. This is due to normal transactional friction. Every method is going to have a cost, the ruling question is whether it's worse than 3%. As jpatokol comments on NickC's answer, you get beat to death doing currency exchange. You may be thinking "if they give me 10 zulecs per dollar, then when I come back, they'll give me 10 cents per zulec". No they won't, they'll give you 8.5 cents per zulec. So that's hideous, that's right out. You can get cash from an ATM machine. When I do random ATMs domestically, they have $4-6 in total transaction fees between the machine and my own bank. So you have to take out $200 at a time just to have the fees be less than 3%. There's also that 3% fee you mentioned. But wait, there's more. At the end of the trip, you now have between $0 and $199 of Dominican Cabbage that is totally useless back home. So that money is a total write-off, and now we're way, way, way past 3%. Obviously you can take it to your local bank and try to deposit it, but they'll ding you with a disfavorable exchange rate just like the above. You can use a debit card. Their rules are all over the map, some even charge a spread on the currency conversion. With debit cards, the merchant pays no or minimal part of transaction costs, so it's all on you. Turns out 3% is a pretty low bar to limbo under. Remember what 3% is: It means buying 34 of something but only getting 33. It means buying a sack of McDonalds fries and getting one less fry. Imagine in Breaking Bad if the skinheads let him keep all seven, but took one briefcase full off the top of one of them. That's 3%. We're not talking highway robbery here. The credit cards charge 3% because they know it's the best deal in town. And with them, in the US they claim you get the most favorable exchange rate, i.e. They don't pinch you mercilessly on the spread, as in the first example. It makes sense because the credit card mechanism is the most operationally efficient way to do these complex transactions. Effectively they are doing the transactions in bulk. Also, the merchant helps carry the weight with his 2-4% merchant fee that he pays on his side of the transaction. Are they profiting at 3%? No doubt. They don't have an obligation to lose money to win, only be cheaper than every other alternative. Use cash. I've got a card that doesn't charge a foreign currency fee (especially chosen for that reason), but before I got it I used to get a suitable amount of cash from a local currency exchange before I left (paying for it with cash in my own currency). Common currencies can usually be done over the counter, less common ones may need to be ordered in advance, so as it's so close you'll probably have to be it there using your debit card in an ATM. no fee for standard accounts. free ATM withdrawal up to 200 USD/month. More if you subscribe to premium. Anything over the above limits is charged at 2% of value of ATM withdrawal. getting a physical card costs 4.99 GBP including delivery, or you can use the https://revolut.com/r/franck2q2 referral link to get a free physical debit card. There are now a bunch of banks that have special programs for frequent travelers and expats that can’t/don’t want to open a bank account in the country they’re in. Notable ones are the N26 Black account and Revolut. I don’t know the details about Revolut, but for N26 there’s a 6€ subscription fee every month, but then using an ATM or paying abroad is free. So no flat fee, but also no exchange rate markup. You've already gotten a lot of answers that tell you to get a better card. There are two other things I want to mention about using cards in other countries. Besides any fee your own card might charge you, some card terminals, particularly ones you find at locations that see frequent tourists, detect your home currency, and offer you the option of paying in their native currency or yours. Do not choose yours. Basically, they've done the conversion for you to make you feel comfortable about how much you're spending, in a currency you can think in, but they charge a decent fee to do it. Usually it's in some small print on the terminal somewhere, or it's just baked into the "conversion rate" that they're displaying to you and you can't even tell how much they shaved off. And of particular note to you, charging in your own currency would not avoid the Foreign Transaction Fee your card charges, because that fee is about the location of the merchant, not the currency conversion, so you'd get hit with both. Just choose the native currency and let your card do the conversion. Our cards here in the US have chips now, but we still sign for transactions. In most other places in the world, they use the chip with a PIN to authorize the transaction. Despite having the chip, very few American cards support a PIN for retail transactions. When you're at a cashier this is usually fine because although they may not be familiar with it, their terminals can usually handle a signature transaction. Where you run into trouble are kiosks and automated systems. They won't work with a card that doesn't support a PIN. I only found one a few years ago, and it was the Bank of America Travel Rewards card. It's otherwise pretty crappy in my opinion but could be useful if you want something with good foreign compatibility that won't cost you anything. For a more recent card that fits those criteria, the Uber Visa checks all the boxes, and actually has some decent rewards too (4% back on restauarants, etc.). Discover has a bunch of cards with no annual fee and no FTF, but their acceptance outside the US is miserable. Even in Canada I could barely use it. As others have said if you're willing to pay an annual fee, you'll find a bunch more that have no foreign transaction fee, but you have to look harder (and possibly call them) to figure out if they support a PIN. The high fees may be an issue specific to your card provider. Compare different credit/debit cards available to you. Some cards are marketed specifically towards travelers, and therefore feature very low (or even non-existing) fees abroad. There are also prepaid debit cards specifically for this purpose, often also with low fees. Not the answer you're looking for? Browse other questions tagged money payment-cards or ask your own question. Is it possible to manage without cash, but with credit cards only when visiting San Francisco?